We strive to ensure MacVector has good forwards and backwards compatibility. For example MacVector 16.0 will still open files created with the very first version of MacVector. However, since Apple release a new operating system every year, and generally make fairly significant “under the hood” changes, it is not possible to support every version of OS X and macOS. Furthermore although we strive to ensure releases are compatible with future OS releases, Apple do not always make this possible. Therefore it is not possible to officially support a particular version of MacVector on macOS/OS X versions that have not yet been released. 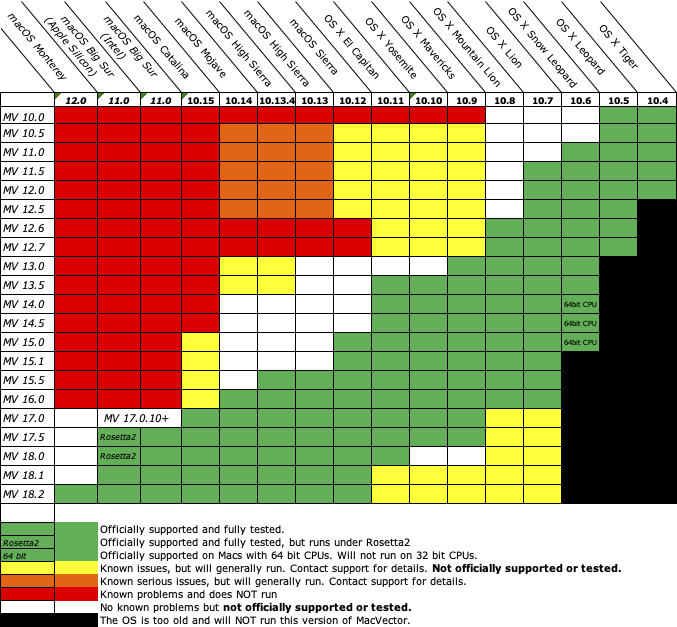 The table below shows which version is officially supported on which versions of OS X/macOS. Please contact the Support team if you have any questions.